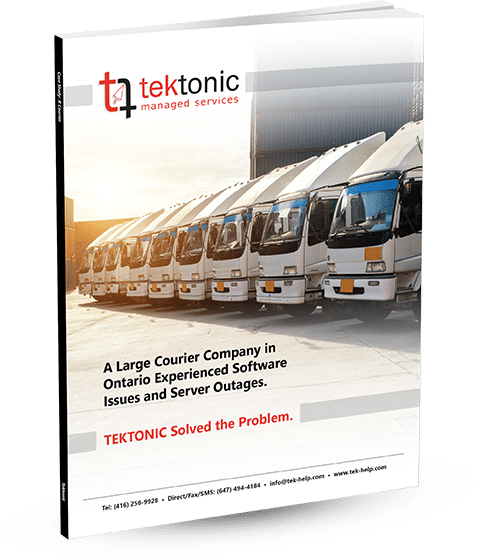 Toronto’s R Courier – – a privately owned courier company with over 300 employees – – needs protection from server crashes and other IT issues, and that’s why they trust in Tektonic. R Courier offers courier services to local, national and international businesses, and handle pickups and deliveries for a large number of healthcare agencies and laboratories across Canada. Fast, reliable service for their clients is always their priority. When one of their software vendors performed updates on their rcoMobile application, causing the application to freeze and the entire server to crash, they relied on R Courier to get them up in running again. R Courier knows that Tektonic is a leader in the Canadian IT industry, and recommends their services to all other businesses in the area. calling (416) 256-9928 or emailing sales@tek-help.com right now.